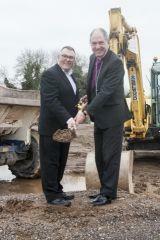 The new Bishop of Exeter, Rt Rev’d Robert Atwell and Councillor Tudor Evans presided over the official turf cutting ceremony, held to mark the start of building work on St Matthew’s Church of England Primary and Nursery Academy in Derriford. as well as ensuring children reach their full potential” enthused the Rt Rev’d Robert Atwell. St. Matthew’s CofE Primary and Nursery Academy, part of the Diocese of Exeter, is part funded by the Department of Education and Plymouth City Council and run by the Diocese’s St. Christopher’s Primary Multi Academy Trust (MAT). Ensuring there are sufficient primary school places for Plymouth’s growing population, it will eventually take 90 pupils a year through a three form entry with the capacity for 630 pupils aged 4 – 11, plus a 27 place nursery.